1. …….abrupt change of pressure and density moving as a wave front……… caused by an intense explosion or supersonic flow over a body. Well, I’m not sure you’ll get quite the dictionary reaction described above, but a generous amount of fresh lime and a dash of 151 with Baja WAVE gave this potion a definite jolt and elevated it to the favorite amongst my taste testers. This was a given as soon as I saw the WAVE bottles. It’s perfect party material that you can really amp up and your guests will love. The Wavebands are colored layers of vodka jelly and the Wavelets are nudes made in ice trays. Watch the video for more detail. If you haven’t had sherbet shots before now, they’re always a big hit with guests and the flavored WAVEs are ideal for mixing. 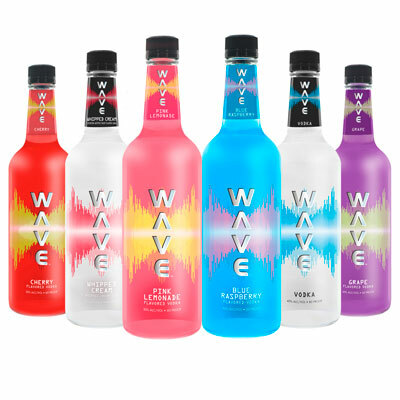 Just add a mini scoop of your favorite sherbet to a shot of your favorite WAVE vodka. Ones of the world’s favorite drinks, the Mojito, made WAVE-style with Lemon Lime vodka. And for good measure, a variation on the theme with rosemary and ginger ale instead of mint and club soda. Either way, deliciously delightful. WAVE also comes in Grape, Whipped Cream and Blue Raspberry and, as you can see, it’s easy to make WAVEs with frequency. And at a suggested retail price of $8.99, Sazerac is poised to ride the wave of the growing flavored vodka market. PS. Apologies for all the “waveisms”, I just couldn’t help myself. I’m waving goodbye now.